The 9 Best Corn Mazes in West Virginia! The colors are changing from green to vibrant hues of red, orange, and yellow. It’s time to head out to West Virginia’s local farms for pumpkin patches, hayrides, and of course….corn mazes! Celebrate the harvest and check out our favorite corn mazes in the state. Grab your girls and guys and come on down to Gritt’s Farm in Buffalo, West Virginia, for some great fall fun! Kids aren’t the only ones who’ll have fun at this family-oriented farm. Kids of all ages can pick their pumpkin, enjoy some great barbecue and fresh lemonade at Nellie’s Kitchen, ride the zip line, shoot apples from a cannon, join a hayride, and play with goats. It’s fun for all and all for fun! Pick your own pumpkins at Okes Family Farms in Cool Ridge, West Virginia. This is the perfect place to take the kids. Make this your family tradition to kick off the cool fall weather and jump on the tractor train, slide down the 100-foot slide, go through the hay tunnel, and make it through the corn maze. Beautiful flowers and delicious food aren’t the only things you’ll find at Green Acres Farm and Greenhouse. This friendly farm really is the place to be. Located in Rock Cave, West Virginia, you’ll find fresh fruit and vegetables, get to pick your own pumpkins directly from the patch, and try making it through the 3-acre haunted corn maze. You’ll even get a free pumpkin pie with your corn maze ticket! Get ready for the annual corn maze at Brookdale Farms in Fort Ashby, West Virginia. Open mid-September and every weekend through the end of October, there’s so much to do and a great place to take the family. If you’re considering a fall wedding, this is an ideal location for that, too. People pick pumpkins at Byrnside Branch Farm. Located in Union, West Virginia, pumpkin picking isn’t the only fun thing to do. 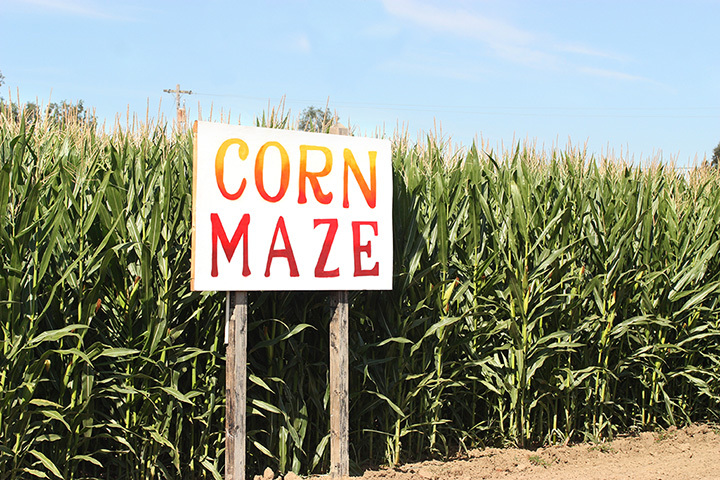 There are 4 different corn mazes to complete ranging from 18 acres to 2 acres. Kids have their own corn maze, and for the brave at heart, there’s a twilight maze that will test your navigation skills. Old MacDonald really has a farm and it’s located in Inwood, West Virginia. Besides pick-your-own pumpkins, it’s a perfect location for groups of all kinds and special rates are available. Join other fall funsters for hayrides, animals, tube slides, a corn castle, playground, and a 5-acre corn maze. Pack a picnic and make a day of it! If you only visit 1 corn maze this year, make it the one at Cooper Farms in Milton, West Virginia. The Farm has been building amazing mazes for years that honor emergency responders and other notable folks, and every year the design is different. There’s even a haunted maze for those who want to add a little fright to their night. For the younger set, there’s a corn crawl crib and everyone is welcome to sit around the camp fire and tell stories after picking out their favorite pumpkin. If happiness grew on trees or in a patch, you’d certainly find it at Orr’s Farm Market in Martinsburg, West Virginia. Children will be introduced to Spookley, the Square Pumpkin when they visit. There are so many fun things to do here that it’ll be hard to decide what to do first. You can take a hayride to the pumpkin patch and pick out your own pumpkin, go through the corn maze, pose for a photo, and just have fun with friends and family. Mark September 15 on your calendar because that’s the date when everything will be up and running at Nicky’s Garden Center in Wheeling, West Virginia. The annual harvest celebration begins and includes beverages and sweet treats at the onsite coffee shop, pumpkins (of course), and a corn maze. The corn maze is designed for children ages 10 and under. Pick up a pumpkin candle in the gift shop to take the pumpkin patch aroma home. View more West Virginia Corn Mazes.